There are few simple answers in business or in life. Consistent success comes from resolving paradoxes and moving forward. We bring this principle to bear as we help you and your organization drive exceptional performance. This starts with how you work with customers. The Change Agent Group delivers results through a team of experienced change leaders who are focused on both personal and organizational success. We base our work on proven methods and research - combined with some common sense of what fits. 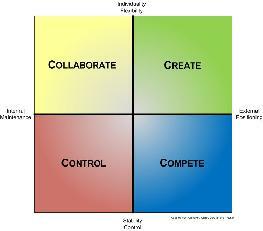 The core of our culture, leadership and value creation work is the Competing Values Framework. This discipline is a widely-used, successful and adaptable approach to value creation that has been named one of the 40 most important business frameworks in the history of business. Innovation and entrepreneurial research have shown that change can be an ally if you are a consistent scanner, a disciplined innovator and a "Yes-and" thinker. We apply the principles of Blue Ocean Strategy and other proven methods to create new customers, service offerings and market spaces. We also apply the latest research in applied neuroscience to give you an edge in improved decision making, staying cool under pressure, collaborating with others and facilitating successful change.